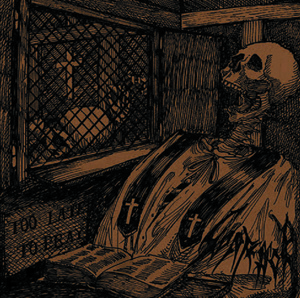 CONFESSOR A.D. - "Too late to pray" MCD out now! ils pratiquent un style à la croisée du death metal old school et du black metal, avec des influences de thrash ancien. Leur musique rechauffera les blessures de ceux qui aiment le metal Européen et Scandinave du début des années 90. Leur premier enregistrement composé de cinq morceaux est maintenant disponible en MCD pressé de façon professionnelle, qui vient avec une pochette couleur. Si tu fais partie d’un groupe ou label, envoies un message! Bands/ Labels get in touch ! 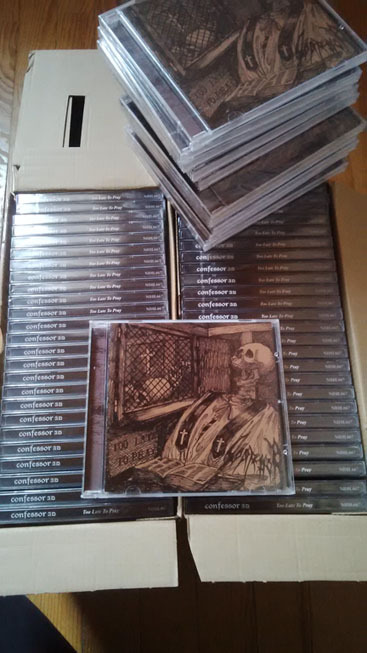 Confessor A.D. of Strasbourg, Alsace France have put out their debut EP this year on Nihilistic Holocaust, a French label that has a habit of releasing worthy efforts in the death metal realm and who should be familiar to committed readers of Contaminated Tones. Too Late To Pray's five songs are of the no-slouch variety. The songs all coincide well, yet retain unique identifiers for those that enjoy their death metal skirting the boundaries between death, thrash, and black. Confessor A.D. has a distinct melodic vision which sounds classically or formally inspired. While the band is not afraid to attempt some less deathly elements, they never veer out of the metal genre. The songs are sturdy and well composed and the recording and technical elements behind it are well done with every instrument given space in the mix. There is a defined focus on the bass in the recording to the point where I believe that bassist Aksel is the head honcho in decision making. He may for all I know have written the majority of the songs since he is such an anchor and including the fact he doubles as vocalist this is likely the case. The songs could be described as revolving around the bass lines, an inverse experience in a genre when the guitars are the main melodic instrument. He is fun to listen to, especially in "Endless Night," where his fills highlight throughout. The prominence of his bass performance is such that it negatively impacts the perceived energy of the other instruments and specifically Killian's guitars which don't sound nearly as invested in the music. Julien's drums and are standard C-grade average death metal drums. After several listens, I'm not beholden to any of the tracks. "Deafening Confession" is a powerful opening salvo; it's distinct early Floridian style is appreciated during a period of time when the majority are coasting on the coat-tails of the Swedish and New York style. It wouldn't have made the cut for Scream Bloody Gore, but it wouldn't sound out of place. The more rocking "Haunting Enemies" goes for big chords and a doomier vibe, with a short stonerish solo section. It is the least death-metal song and stands out for this, possibly in a negative sense. "Hipster Killer" touches black metal influences but remains in the Floridian style for it's verse and bridge sections. A gravelly chorus with a ghoulishly playful theme is incorporated twice in the track to add memorability. "Silent War" has a phenomenal mid-section with a bass-heavy line that runs separate from the guitar melody and adds the depth of song-writing which I adore. It's my favorite on the record. "Endless Night" culminates. It's a thrash track but it's slower refrain sections bash through the fracas. Confessor A.D. will have to decide where their style will take them, because they are caught now between several different voices in their music that aren't fully integrated into each other. I'm oddly fond of what they are presenting to me but it's not going to make me shell out cash for any future release unless they can get the intensity heightened and the urgency implanted into the recording. They have a chance to go for the style which Witchery have done so well, and appear to have a similar rock-n-roll attitude to their tracks and pacing. Seeing where Confessor A.D. drifts to will be a determining factor on whether they revel in underground adoration or shrink to a footnote. Imagine if you will, back in the early 90s AMON AMARTH decided to ditch the whole Viking shtick and concentrated on just something sounding more thrash oriented as well as having melodic death metal traces. Well here you go What If-ers. CONFESSOR A.D. is a band hailing from France that fits that scenario. On this their debut EP the band puts forth five cuts of unashamed early 90's influenced death thrash with a vocalist who could be a stand in for Johan Hegg. Although according to their promo info the band states that black metal is within the mix I say no. The only thing I can say bad about this release is that at times the drummer sounds like he's banging on Tupperware. Other than that the riffs are sinister at most times, happy and melodic at others. Song structures grab a hold of you and wanna induce slam pit action. All in all a cool sounding start plus they do a hipster hate song which is huge points in my book. Les chroniques du MCD de CONFESSOR AD continuent d'arriver! En voici une série pour que tu te fasses une idée! As far as I know this French band is a three piece and hits us with a debut EP that has a primitiveness that is matched by the album art work that has a medieval flavour to it. My reference to primitive should not be equated to being poor it should be matched to being grisly, dark and nasty with a crudeness that sees the opening track 'Deafening Confession' start with a proto death metal riff style I was listening to back in the mid-80s. The sound afforded is crisp but raw and enables the instrumentation to be given prominence especially the drums which have a clamouring sound which I like as they have good definition with an organic feel especially when the double bass rolls in and sounds genuine and not processed. 'Haunting Enemies' has a doom like start with an eerie hook to it before the track shifts focus in speed as the vocals have a clarity to them, with an enunciation of the lyrics that is decipherable but guttural. The riff is catchy and in some respects there is a dense thrash undercurrent to the tune underpinned by the rhythm of the song. That thrash like posture is present in 'Silent War' but don’t misinterpret me, the songs are death metal as the tune gathers momentum and as you focus on each instrument you hear the bass work busily engineering the foundations of every song rumbling along like freight train. The switching of tempo is something the band does very well as the riff break is superb and has a slight ghoulish aura to it, creepy even. Closing the EP is 'Endless Night' which returns to death metal and speeds along but like before that proto death metal is apparent and the thrash tendencies are evident which the band may disagree with as yet another awesome riff break intercedes and pushes the speed upwards. This is a killer debut EP with a true retro appeal for those craving a genuine sound from yesteryear with a no frills approach and if you choose to check it out you will not be disappointed as I for one will look forward to the bands next release. A l'heure où Enjoy The Violence ravive des souvenirs émus dans bon nombre de foyers métalliques et potentiellement nostalgiques, le moins que l'on puisse dire est que les Strasbourgeois de Confessor A.D. arrivent à point nommé avec leur premier EP, Too Late To Pray. En un peu moins de vingt minutes, les Alsaciens vous fournissent de quoi ressortir l'étendard d'un death old school (mâtiné de black et de thrash) que l'on n'a au final pas l'occasion d'entendre si souvent, de le brandir fièrement dans la rue et d'appeler de vos vœux une suite longue durée. Dès les premières secondes de « Deafening Confession », on comprend que l'on a affaire à un groupe qui sait de quoi il parle, qui sait ce qu'il veut jouer, et qui sait comment le jouer. Épaulé par un son seyant parfaitement aux sphères dans lesquelles il perpètre son death metal et armé de zikos maîtrisant leur sujet, Confessor A.D. nous accueille avec une piste qui rappelle, par exemple, la découverte de Bloodbath à l'époque de leur premier 3 titres, et notamment le cultissime « Breeding Death », auquel « Deafening Confession » emprunte ce côté « hittesque », ces riffs facilement mémorisables (voire tout simplement mémorables) et ces cavalcades effrénées. La prod' est, sans surprise, moins « suédoise », mais comme dit précédemment elle convient tout à fait au genre et permet une singularité dont ne peuvent bénéficier toutes les grosses machines enregistrées chez Tägtgren et consorts. Clairement, ce disque sent bon les 90's et quelque part il fait penser à ces « excellentes démos » louées par Daniel Ekeroth dans son Swedish Death Metal, dont il estime que certaines ne furent jamais égalées par leurs géniteurs quand ils passèrent au stade de l'album. Deux différences notables cependant ici, d'abord Too Late To Pray est un « pro MCD » qui porte bien son nom (impossible d'arguer qu'il a été enregistré dans une cave ou une MJC avec un magnétophone 4 pistes) et ensuite, malgré les évidentes qualités de ce 5 titres, on peut logiquement penser –et souhaiter– que Confessor A.D. enfoncera le clou dans les mois ou les années qui viennent avec un album destructeur qui emmènera ses compos encore plus haut, encore plus loin. Mais pour le moment, satisfaisons-nous de ce que nous avons. On aurait tort de se priver : le reste du mini-cd est à l'avenant de « Deafening Confession », avec des morceaux qui regorgent d'idées et de riffs intéressants, de changements de structure (beaucoup moins brutaux que la musique en elle-même, je rassure ceux qui commençaient à voir se profiler une publicité mensongère à travers la mention « death old-school »), d'harmonies, d'agressions en règle, de ralentissements bienvenus et de trouvailles ingénieuses. Quand vous cumulez le tout, vous obtenez indéniablement un groupe au fort potentiel qui peut légitimement aborder l'avenir avec sérénité et ambition. Chacun pourra y aller de sa comparaison flatteuse pour évoquer la musique des Frenchies, le Sick de Massacra plane sur « Haunting Enemies » (il y a pire comme référence), dans lequel on peut également déceler une certaine affection pour Death ou Loudblast, période Cross The Threshold (au risque de me répéter par rapport à d'autres chroniques, j'insiste sur l'aspect subjectif de ces analogies…). Des rapprochements similaires, on peut de toute façon en effectuer tout au long des dix-huit minutes, l'essentiel étant de retenir que la démarche est honnête et que le but de créer son oeuvre propre est atteint. De manière générale, ce qui ressort à l'écoute de ces cinq titres inauguraux, c'est la capacité de Confessor A.D. à digérer ses influences et à se mettre en quête d'un death metal varié et personnel. Les qualités intrinsèques des musiciens ne font aucun doute : un vocaliste qui rappelle Åkerfeldt, un batteur qui assure sans perdre les pédales et sans en mettre partout, un guitariste qui tisse sa toile (on aurait presque envie de dire « raffinée », bah allez on se lance) sur chaque titre, et… C'est tout, Confessor A.D. étant un trio ! Cette cerise sur le gâteau au kirsch finit de nous achever. Ces ennemis de la complexité forcée et de l'apparat (« Hipster Killer », hum, j'en connais qui préfère les actes aux postures) ont le don de faire paraître simple ce qui est à l'origine très élaboré, ce que beaucoup de fans d'extrême apprécieront, à coup sûr. Pour rendre hommage à cette formation sur laquelle on compte désormais, on conclura également avec simplicité : la suite, vite ! Ke starým pořádkům se obracejí kapely po celém světě. I ve Francii. Tam se dalo dohromady trio metalistů, kterým proudí v žilách krev z osmdesátých let. Z let, kdy se metalový extrém nedělil tak pečlivě jako dnes, z let, kdy skoro každá kapela, která dělala kravál, byla in, nehledě na to, jestli produkovala nadčasovou, obyčejnou, nebo zbytečnou muziku. Úvodními slovy nechci naznačit, že by CONFESSOR A.D. patřili mezi zbytečné kapely, ale to, že tihle borci na to jdou ze stejného lesa jako jejich tatíci, že jim nesmrdí míchání death, thrash a black metalu a že jim jde v první řadě o zábavu. Počítám, že na koncertech bude retro zabírat víc než při domácím poslechu, nicméně ani ten nepovažuji za zbytečné mrhání časem. Hned úvodní rotyka „Deafening Confession“ hrne hlavně v thrashovém tempu, bicí jedou tupa tupa, kytara typické thrashové riffy a melodie, basa drnčí a vokalista používá spíše do deathu hozenou polohu. K deathu ostatně na chvíli sklouzne i hudba, v druhé „Haunting Enemies“ pak hraje death´n´roll prim. Nedá se říci, že by produkce CONFESSOR něčím omračovala, na druhou stranu má materiál necelých osmnáct minut a jako startovací MCD plní svou funkci víc než dobře. Kapela se představuje v různých tvarech, nebojí se ani zpestřujících motivů (právě ve druhé skladbě se objevuje skoro progresivní vsuvka), ani trochu humpoláckých postupů, které ale k dobám, k nimž pánové vzhlížejí, tak nějak patří. Вот это, мать вашу андеграунд… Даже в бездонной клоаке интернета мне не удалось отыскать никакой информации об это группе, поэтому единственным источником остается лишь записка мистера Сковрона /мастермайнда издающего лэйбла Nihilistic Holocaust/, вложенная в бандероль с его новоиспечённым релизом. Да и она не дает нам четко понять, кто и что есть CONFESSOR AD. Единственное, что мы можем доподлинно из нее почерпнуть, так это то, что формация является соотечественником Габа и дислоцируется во французском Страсбурге. Вот, собственно, и все. Было бы резонно предположить, что этот MCD является для группы дебютом, так как информации о других работах мне, так же, найти не удалось, но, даже если это и правда, у меня не поворачивается язык подписаться под этим, так как материал слишком уж хорош и определенно продуман, несмотря на всю свою кажущуюся сырость. Заявленный лэйблом блэк/дэт на «Too Late To Pray» очень интимно граничит с европейским воплощением прото-трэша, в свое время пересекающегося с еще не сформировавшимся блэком. О, блин, завернул. Но я думаю, что всем и так понятно, что шлак под вывеской Nihilistic Holocaust, давший мировому подземелью несколько десятков отличнейших имен, выпускаться не будет. Босс не допустит, хахах! Тащем та, хотите провести 17 минут между виселицей и чистилищем? CONFESSOR AD к вашим услугам! Stilistisch haben sich die Jungs aus Straßburg dem Black Thrash Metal verschrieben und donnern auf ihrer Debut-EP „Too Late To Pray“ von Beginn an munter los. „Deafening Confession“ überrascht hierbei mit einem Blumenstrauß aus etlichen interessanten Riffs, die sich direkt aneinander reihen und präzise abgefeuert werden. Hier liegt auch die Stärke und Schwäche der Scheibe: in allen fünf Songs findet sich eine Fülle an Ideen, die jedoch gelegentlich nicht ganz zueinander passen wollen. In einem Moment erklingt ein Speed Metal Riff und im nächsten dröhnt thrashiger Death Metal aus den Boxen. Dadurch ist es schwierig die einzelnen Songs zu fassen zu kriegen, obwohl viele Ansätze wirklich hörenswert sind. Man müsste auch gar nicht auf einzelne Elemente verzichten, sondern diese einfach besser in die Songstruktur integrieren, sodass das Gesamtwerk homogener klingt. Bei der Produktion wird der Oldschool-Gedanke groß geschrieben und eine analoge Aufnahmetechnik verwendet, was für einen angenehm räudigen Sound sorgt, der jedoch durchaus etwas mehr Druck vertragen hätte. Insgesamt liefern CONFESSOR A.D. mit „Too Late To Pray“ ein ordentliches Debüt ab, das Fans von KETZER und Konsorten gefallen könnte. Besonders in Sachen Songstruktur gibt es aber definitiv noch Luft nach oben!